For those who can read Chinese, I'm sure you must be wondering how does this dish resemble “玉” which is "Jade" when translated. Of course, it is not the spring onion we have used for garnishing! The original ingredients were Chicken Meat, Premium Ham a.k.a 金华火腿 and Kai Lan. 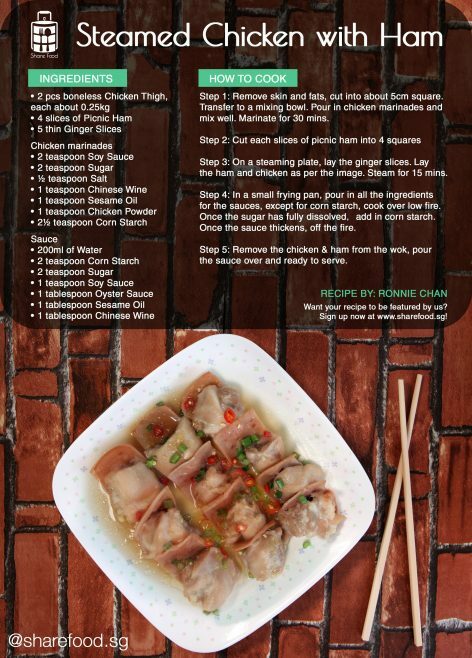 Hence, when we noticed that this recipe is slightly different from the original recipe, we sort advice from our home cook Ronnie Chan, who provided us his recipe, "I had this dish in a popular local Cantonese restaurant and we (Ronnie and family) fall in love with it the moment we took the first bite!" 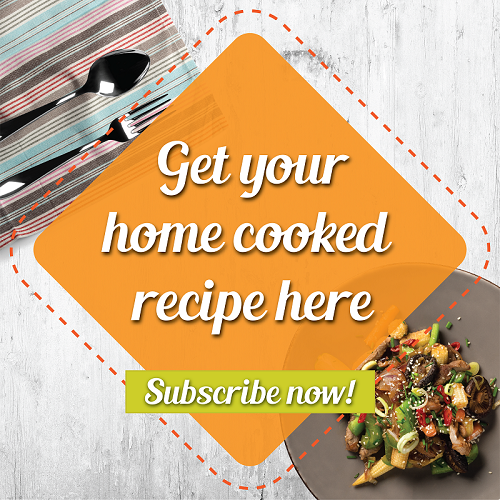 So without any hesitation, he went ahead to look for the recipe so that he and his family can savor this dish at the comfort of their home anytime. The premium ham was also another key ingredient to this dish, in which Ronnie innovated it by using Picnic ham as it can be easily found in any super markets. To be honest, when we first saw the picture and the list of ingredients, we were a little skeptical as it simply looks too healthy to be tasty. However, to our surprise, it was superb! So, if we are only given 2 words to describe this dish, we would say it is HEALTHY and SUCCULENT! We believe this dish will be well-loved by everyone in the family! Try this Steamed Chicken with Ham today! When we first saw the picture and the list of ingredients, we were a little skeptical as it simply looks too healthy to be tasty. However, to our surprise, it was superb! So, if we are only given 2 words to describe this dish, we would say it is HEALTHY and SUCCULENT! We believe this dish will be well-loved by everyone in the family!